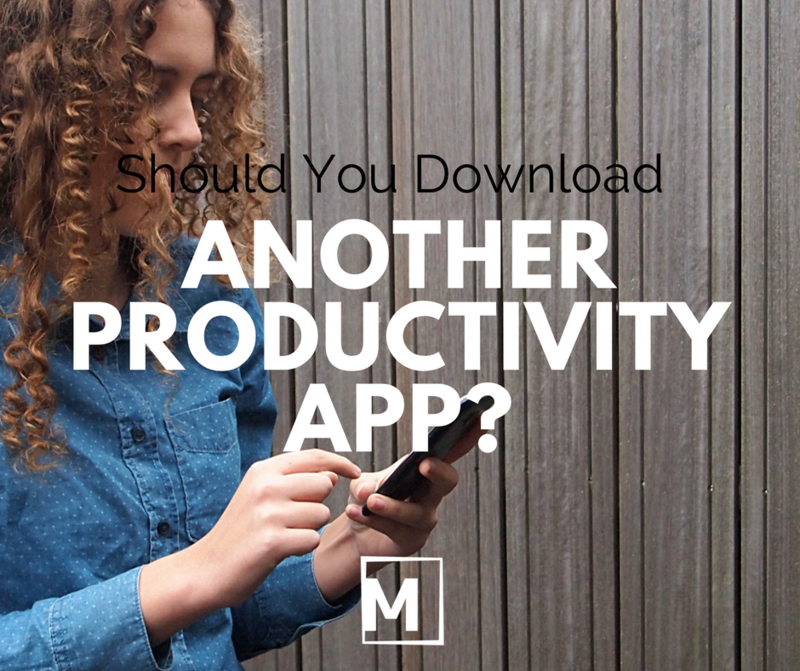 Should You Download Another Productivity App? Another productivity app anyone? Maybe a new Markdown editor or todo app for your smartphone? Wait! Before you hit the download button, think again. There is an upside to an app that works for you. There is also a downside to any app that steals your focus. I've certainly felt this. When my work tools are helping me get things done, it fees good. When I'm tempted to test out something new, there is a slight feeling of unrest. There really is a spiritual component to our work. As Carl Pullein says, your apps should work for you, not the other way around. To save you time, I've tested out the latest version of Omnifocus (version 3.0) and it's quite strong. That doesn't mean that you should use it but you should watch the video. If you like the app, the OmniGroup is prepping for a May 30th public launch. I teach people how to pray using simple online tools like blogs and video. f you’d like to be included in my regular email with tips and tricks for praying better, you can sign up here. I was reminded of this during a recent 5am shuttle to the local airport. There I was with the driver and two men who I did not know. Let’s just say that there wasn’t a whole lot of small talk. You have probably had that same kind of experience. You’re with strangers and simply have nothing left to say. That’s perfectly acceptable but we often feel like we should be filling each moment with at least some form of noise. When it comes to prayer, silence can also be scary. We aren’t sure what to do. We want to hear the Lord’s voice but He rarely speaks audibly. We wait and nothing seems to happen. All of this is normal. Don’t stress. I have this happen too. So here’s a simple trick for when you have a silent moment of prayer- be still and let the thoughts come and go. You’ll be bombarded with random thoughts, odd things that pop into your head. You’re not sure why. You had no idea that your head was so noisy. Imagine that you’re on a beach and looking out on the water. You see a boat come into your sight. You could swim out to that boat and get a closer look. After all, it looks so interesting and the people on the boat are having a great time. Or, you simply let it go. You could just go back to whatever you were doing and just let the boat sail by. Now apply this same trick to your prayer life. You’ll close your eyes when you are praying, wanting to just “be” with God. You’ll want to enter into the silence and then a random thought will pop into your noggin. Like the boat metaphor, let it go. Sure, you could linger with that thought and really get a better look at it. It’s probably interesting and worth your time. But now, for at least a few minutes, just let it go. You can do this. I’ve been using this trick for years and it works nearly every time. It can work for you too. Praying for someone else is a core part of what it means to be a prayerful person. It’s common, after all, for someone to ask for your prayers for them when they are sick or experiencing a hardship. Still, most of us don’t know exactly how to pray for the person when prayers are requested. Be honest- the last time someone asked for your prayers, what did you do? I reflected on this recently as a friend of mine is going through a tough time. I’ve done all I could to help but I’m at the point where prayer is now my best response to him. You can see that by praying “big” and “small”, you’re covering your bases. It’s a faithful and strategic way to pray and gives your heart and mind the space to let God do the work. You’re doing your part, for sure, but you’ve positioned your heart to communicate to God your needs and the needs of your friend. Try it out and see how you like it and how it works. I decided to do the TPA awards for a second year after the positive response from last year’s awards. A few disclaimers are helpful: I’ve tested each and every app in the list. Second, if I’m an affiliate for an app, I indicate that in the award. One new feature in this year’s awards is the inclusion of a “Best Prayer App”. Since prayer can make you a more productive person, why not highlight two apps for you to try in 2018? Ok on to this year’s awards! TickTick is this year’s best all around todo application, mainly due to its versatility and customization. It offers Smartlists, Themes, Natural Language and so much more. It even has a Pomodoro timer for tasks if you want to track your work. Want to use Touch ID to protect your projects? You can do that too. TickTick will even give you a weekly achievement score and visual “map” of your most productive day. You won’t be disappointed with TickTick. Todoist is a phenomenal app. Sure, it’s due for a UI refresh but if you are looking for productivity app that can be customized to suit your needs, Todoist can handle anything. The natural language input is the best in the business and its various color themes take your personalization to another level. Things3 from Cultured Code has its limitations and that’s by design. It still isn’t my favorite app for file attachments and you can’t use Things3 to collaborate with peers. But, the 3rd version of Things did not disappoint in 2017 for its stunning visual design and a “less is more” approach to productivity. It’s the one app that is actually fun to use when you are trying to get things done. If you don’t require deep natural language input or collaboration, Things3 will make you enjoy using a todo app like never before. Not including OF in this year’s list would be like omitting a Mercedes from a list of luxury cars. While its UI is ready for a refresh, OF is so powerful as a GTD-related app that it can equip you with various customized perspectives. These allow you to work how you want to work, teasing out the projects or tasks that you need when you want them. Asana continues to get a head of steam as a favorite project management app for both individuals and organizations. While the barrier of entry is somewhat high, Asana allows teams to share documents, chat and organize their projects into “tiles” which makes work more fun. The Productivity Show got a reboot in 2017 and the results paid off. Featuring various guests, including some from their “Productivity Dojo”, TPS comes out each week in order to help you be more productive and apply tactical strategies to daily life. The shows gives you a “deep dive” into topics related to productivity. Todd’s podcast is an extension of his best-selling books on creativity and work. The Accidental Creative Podcast is bolstered by its brevity and Todd’s practical advice for working smarter with your colleagues. You’ll get tired just trying to keep up with Francesco as he reviews multiple apps per week. How he finds time to manage a day job is mind-boggling but his output of high-quality videos is what puts him in this year’s top slot. Besides his affable tenor and creative app comparison videos (i.e. Todoist vs. TickTick), Francesco is like an online coach, walking you through different apps without showing a bias. Carl’s channel started as a way of sharing his love for Todoist. Since then, it’s exploded into a full-on productivity channel with multiple videos per week. Carl’s branding has expanded into multiple “Working With...” verticals (with apps, with work, etc.) and he’s a delight to watch. Coming across as a fellow practitioner rather than a lecturer, Carl really wants to help people get more out of their everyday lives. New to the Productivity Awards this year is the top app for daily prayer. We give this year’s top spot to Give Us This Day. Give Us not only provides you with the daily Bible & Mass readings but its interface is playful and easy to use. You’ll find yourself wanting to use it more just as a result of the UI as tabs expand and “fold” down as you click on them. Magnificat is a wonderful app for following along with the daily Bible and Mass readings and offers a daily meditation and feature on the saints. If you enjoy the Liturgy of the Hours, you won’t be disappointed in Magnificat. Want more help with technology and prayer? Click here to get Mike’s free PDF “5 Ways That Noise Wreaks Havok on Your Prayer Life”. Exercise is sort of like travel on the airplane for business purposes- not always fun but effective for clearing out the cobwebs in your head. Getting moving is good for your body and great for your mind. A new idea that I learned recently is called the “thinking walk”. A thinking walk is basically a slightly slower walk than a workout. You’re not moving at a snail’s pace but you’re also not training for a marathon. You’re thinking first and walking second. Most of us do the opposite which is why the thinking walk is so effective. A thinking walk is useful if you have a big idea that you want to ponder. You’re giving yourself permission to think while you walk. I know it sounds kind of weird but once you try it, I suspect that you’ll be a believer like me. The walk can take place at the beginning or even the end of the day. If you really want to take it to another level, you can build a walk into your day, as if it were a scheduled meeting. The advantage to this is that it will force you to think deeply while you walk. After all, you’re on “company time” if you do it this way. When you return, you might even want to jot down a few thoughts you had during the walk. When can you schedule your next thinking walk? Which problems will you ponder when you are walking? Life comes at you pretty fast. My morning began with getting up for my morning routine by 5:30am, waking my daughter for work by 6:15am followed by my wife at 7am. After dropping off the teenager at work, I began my own work as a director of a national non-profit. The morning was filled with email, project lists and a few phone calls. By the time lunch came around at noon, I was ready for a break. The realtor calls with an offer for your house. Your son is sick and needs to be picked up from school. The water bill needs to be paid by Friday. You know something urgent when you see it. I bet your list is much the same. Different items but a healthy variety of whatever makes up "life" for you. A question that I often think about is whether to address tasks when they show up or is it better to schedule them at a time when you can more fully engage with them. I understand this approach but the older I get, the more I'm uncomfortable with it. Even further, the more I work the less I want to use the Two Minute Rule altogether. Let me explain, the Two Minute Rule sounds really good and there is something good about getting things off your plate as quickly as possible. It presumes that you are in an interruption-rich mindset and that you don't mind being taken off task. Think of it as "knowledge work" triage- a few tasks related to this and a few related to that. Keep it all moving, etc. Where The Two Minute Rule becomes a problem is when you are trying to find blocks of time to do uninterrupted work. Think of Cal Newport here, i.e. “deep work”. How can I be truly immersed in my work if I'm allowing myself to be interrupted here and there to practice The Two Minute Rule? 1. Consider theming your days. I've used this approach for years and it's a game-changer. By giving each day a distinct "theme", you are creating containers for your work. Tim Uhl of the Catholic School Matters podcast and I talk about it here. At work, this means that I'm creating content on Monday and focusing on constituents on Tuesday. Each other day has a theme as well. At home, this applies to some of our administrative asks as a family. I don't like to process the mail more than once a week. As a result, each Sunday, I go through the mail as it's been put into a pile during the week. This way, I don't have to deal with it on another day when it might throw me off my game. I’m doing the mail when I want to do the mail. 2. Schedule Interruptible Blocks During Your Day. If you can't use option one (day theming), you might be able to schedule some smaller blocks during your day. As an example, your morning might be dedicated to focused and uninterrupted work but you know that some things need to be addressed before day's end. To do this, you could schedule 1-2pm for those Two Minute Rule kinds of tasks. Then, the rest of the afternoon could be given back to your focused work. However you work, whenever you work, do it in a way that works for you. Instead of giving in to the most urgent tasks, schedule them when you want to deal with them. That’s a form of productivity on your own terms.